Just received my new LM 29. Will start assembling this weekend I hope. Original plan was to place it in the open beside my barn. But I also plan to build a lean-to on the side of the barn as my first building project with the mill. So now Im wondering if I should put it together where the lean-to will go and just build around it. Problem is I think the lean to will only be 9ft wide. The outer side will be wide open, but still that will only leave me with a couple feet at the most on the back side of the mill. Is that enough room do you think. Or should I keep the mill out in the open and use the lean to for wood starage . The mill does not have the trailer package so moving later might be a problem. If I set it up where the lean to is going I'll have snow and rain run off to look forward to until I get the Lean to built. On the other hand if I set up in its original spot it will be in the wide open except for the carriage cover. What do you all think. Don't crowd yourself. You will need a couple feet on the operator side and the other side will collect sawdust. I also toss the waste on that side. With an LM29, I think 9' will work, but you should probably have a plan for waste off to one end, rather than on the side where the sawdust blows. So Ive arrived at 12 feet wide by 36' long. Thats as wide as I can go. So next question is: Do I have the operator side facing out or in? The manual suggests loading logs on the opposite side to the operator but thats not what Ive been doing so far. I think its so you can build a ramp up to the bed. So far Ive just been man handling the logs from the operator side. Plus Id rather be able to take the waste pieces and throw it straight out of the Lean to. I figure eventually I will have some kind of loader to load bigger logs. Or I could still build ramps with a removable piece to allow room for the operator. Is there any reason why I would have it set up with the operator side to the inside? No set it up the way you like my personal opinion is loading from the operators side is backwards . For discarding waste, I always throw it to the side where the sawdust blows, but I'm mobile. That makes only one stack for me to clean up. For a stationary system. I think it may be an easy thing to do to throw the waste behind where the cut starts; as you are walking along, you can grab and toss easily. So my next question is this. I will have an 18’ opening. What is the smallest dimension of the beam to span 18’. Hoping to laminate 3 layers of 2x8 together to make a 6x8 by 18’ beam. Is that heavy enough? I once built a garage with a 24' span. Engineering requirement was a 5 1/8" X 16" doug fir laminated beam. I suspect you are close to that. I believe snow load (if it is a bearing wall) will come into play, unless you live somewhere that it doesn't matter. Wood species makes a difference, too. 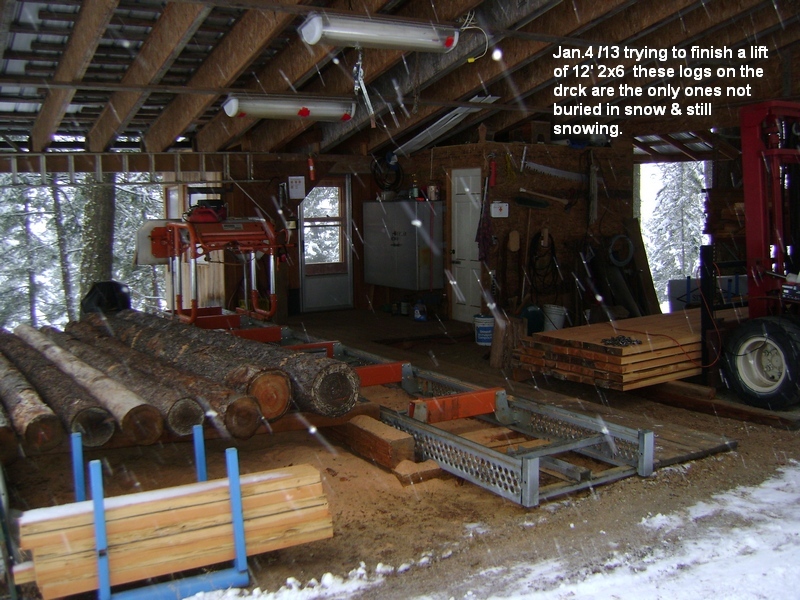 for 18' 2x8 is not adiquate 2x12 full size 2 would do but with 3 you'll never be concerned about any ammount of snow load. If height is a problem or big enough logs you can use 3 2x8's with 3/4 " plywood nailed in between and it will never sag. just stagger the plywood joints to iliminate a weak point. Cut a beam on your mill, if it's too short, make a quick and dirty extension. I'm getting ready to mill a 26' beam on my 21' capacity mill. When I get my homemade extension made I'll post some pics. 2&1/2" square tubing and 1&1/2" angle on top. I used 3- 2 by 12 with 3/4 inch plywood liquid nailed and then bolted together over the 18 foot opening and was overlapped at both ends by a foot. Total length was 20 feet. Installed an insulated 10 foot high by 18 wide garage door. Built it 40 years ago and it never moved or bowed. Alway over build. 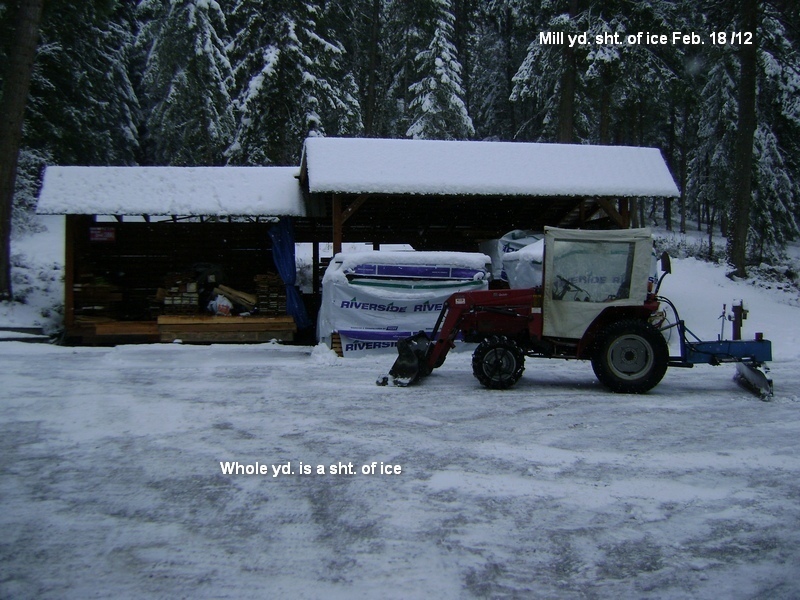 Never have to worry about snow load. Ok. Thanks guys. So if I mill a log ,how about a 6x12 solid beam? In spruce. Just got to figure out the best way to mill an 18 foot beam on a mill that’s made to handle a 16’ log. Shouldn’t be too hard to handle an extra two feet. I've had a 12x6 beam 20' long that's stood the test of time for 20 years now carrying a 14' span roof with plenty of snow a few times no sag so far. Building on left is a 16' span single 2x12 building of left is 20' span 6x12 . How pretty do you want the beam? You could cut half way or so, then stop the saw, move the log, sawhead, and all up a few feet, then restart. The cut may show some strange cut marks, but would still work.